Summer is upon us! The weather is finally warming up and the sun is shining bright. The best activities for the summer are often spent outside, enjoying the world around us. The main thing to do in the summer here in the Upper Peninsula of Michigan is to spend time at the beach. And if you are lucky enough to have family near the beach, you mine as well pitch a tent and live there. We love the fresh water of the surrounding lakes and if we are not swimming, we are fishing. Being outside all summer does come with its health concerns. The first and foremost concern is sun burn. Myself and my children are what I refer to as Ultra White. Image a white porcelain tub, that is the shade of our skin. My son is also a redhead, which if you have one of these amazing people, you will know they are notorious for getting sun burns. I have tried just about every sun screen on the market and even being hyper aware of sunburn and very cautious, we still often burn. So, on a mission to protect our porcelain epidermis, I have compiled a list of some of the best sunscreens on the market for kiddos. What’s up with SPF? SPF is an acronym for Sun Protection Factor. SPF sunscreens protect the skin from ultraviolet radiation. Ultraviolet radiations cause sun burn, damage your skin, is a leading cause of skin cancer, and can age your skin prematurely. 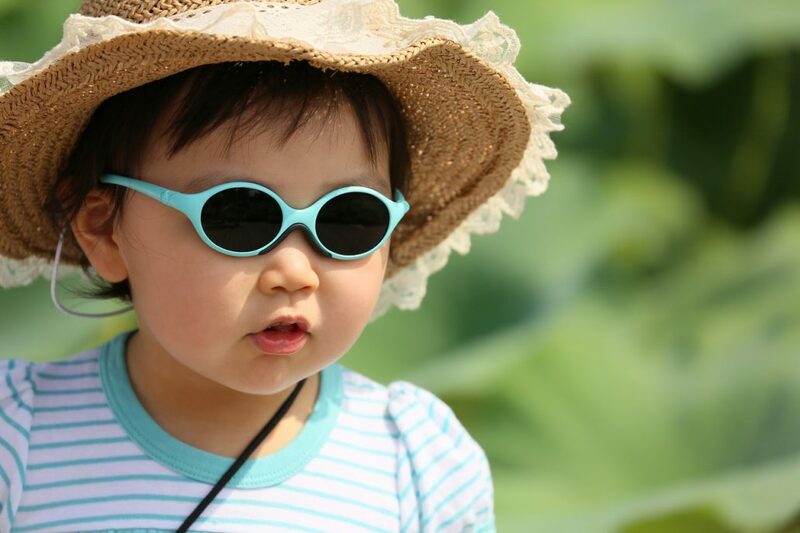 There are two types of ultraviolet radiation, UVA and UVB. UVA radiation makes up approximately 95% of the radiation that reached Earth surfaces. UVA rays are not as dangerous as UVB rays but there is such a large amount of them we are exposed to in our daily life, they are still a huge component of sun burns and skin damage. UVB rays are more likely to cause skin damage and cancers. The time of day that comprises the highest change of sun burns from UVB rays daily is between 10 a.m. and 4p.m. UVB can also cause damage in the winter season from the reflection of UVB rays off snow and other reflective surfaces. An interesting fact about SPF is that most dermatologists recommend SPF 15 or SPF 30 and will tell you that the higher SPF do not increase your protection much. Sun burns are not the only thing to be cautious of when outside in the summer sun. Heat stroke and dehydration are two risks that can occur from prolonged time in the sun. To prevent heat stroke and dehydration you need to make sure to come out of the heat from time to time as well as make sure you are drinking lots of water. Finding areas of shade when out in the summer heat is a great way to decrease your chances of overheating and dehydration. The body can easily overheat when exposed to sunlight and high temperatures. For children, especially, you want to make sure to offer them water during their play time outside. If you find you are feeling weak and fell you could pass out, get out of the sun, and start to hydrate immediately. This can be a sign of heat stroke and you need to make sure to take care of yourself if this should occur. If you are your children happen to get a sun burn. This can be a very uncomfortable experience. There are many products on the market that can help alleviate the discomfort of a sun burn. The best way to help your skin to heal quickly is to make sure to not continue to expose the burnt skin to direct sunlight. If you happened to say burn your shoulders, make sure to wear a shirt that would cover your shoulders until the sun burn is healed. You also want to make sure again to stay hydrated. Staying hydrated promotes skin repair and protects skins elasticity. Lastly aloe Vera is one of the best assistants to help heal sunburn while also alleviating discomfort. You can buy after burn care creams at the local grocery stores or large retailers. You can also apply aloe Vera directly onto the sun burn if you have an aloe Vera plant in your home. I personally like to use just aloe Vera on the kids, simply because it is one ingredient, less chance of chemicals that can be hidden in sunburn relief creams. I hope your summer is filled with sun and lots of fun. By taking the above precautions I hope you have less of a chance for sun burn or any of the other issues that can arise from overexposure to the sun. If you have any tips or home remedies for sunburn care, please share with the readers. As each of us comes from a different background and area of the country, we may not know all the options for sun burn care and sharing is a great way to learn new things. Have a great and safe sunny summer.